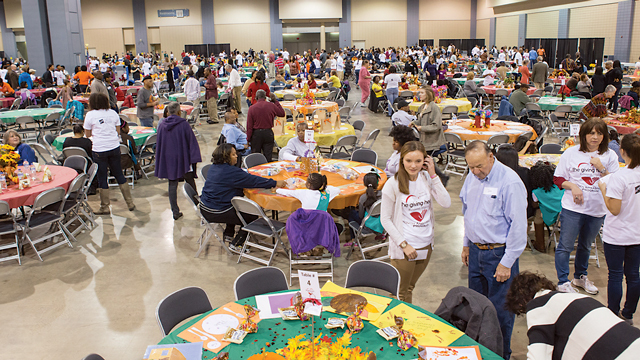 To learn how to volunteer at the Community Thanksgiving Feast, click here. Joy Elliott was talking with some volunteers at The Giving Heart’s annual Community Thanksgiving Feast several years ago when she saw a young man with his head in his hands across the room. He looked miserable. When she caught up with him later at the event at the Greater Richmond Convention Center, she asked what she could do for him. He began to cry. The 20-year-old told her he was homeless now, sleeping on the porch of a VCU apart- ment. He had been going through trash cans looking for pills he could use to commit suicide, and had come to the Richmond Convention Center on Thanksgiving looking for water to complete his mission. “He saw people lined up so he got in line to get a bottle of water,” Elliott says. Elliott talked with the young man for hours that day. She arranged counseling for him, and found him a bed in a shelter. The interaction made Elliott realize just how important the Community Thanksgiving Feast can be. It means more than simply sharing a meal on a special holiday. “His life was saved as a result of The Giving Heart,” Elliott says. Vicki Neilson founded The Giving Heart in 2003. The nonprofit hosted its first Community Thanksgiving Feast two years later, when another organization that had been hosting a similar operation, which mainly served Richmond’s homeless population, discontinued its event. Since then, every year, hundreds of volunteers have offered time, talent, and funding to execute a feast on Thanksgiving afternoon for upwards of 3,000 guests, including families, seniors, the homeless, and college students from around the area. The volunteer chef for the 2016 dinner was Xavier Beverly, co-owner and head chef at The Camel in Richmond. 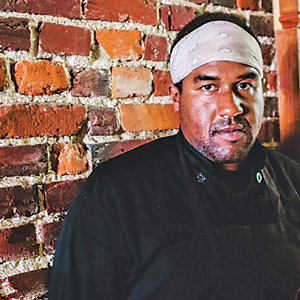 Chef Xavier Beverly of The Camel in 2016. Other volunteers are needed to perform various tasks in the dining area, entertain, work donation tables, and offer information from their own organizations. The day before the event, volunteers prepare food and organize things for Thanksgiving Day. Neilson says one special volunteer opportunity is for students and young adults, fourteen to twenty-four years old, who act as the official servers that day. In addition to a traditional Thanksgiving feast of turkey and all the trimmings, the Giving Heart works to coordinate other important services during the course of the day. After the meal, guests have the opportunity to browse an on-site donation center and leave with food bags, self-care items, or other seasonal essentials, such as gloves, hats, scarves, and blankets. This year, a blanket-making opportunity on Wednesday should increase the number of blankets that are distributed. “This started last year as a last-minute project and was very popular with our volunteers,” Neilson says. Guests can also get a free haircut, thanks to the donated services of local barbers. Transportation is available to and from the Feast from various points around Richmond. “Last year, we worked with GRTC to meet some of the transportation needs within the city. Our goal this year is to expand this community outreach and make it available to even more people,” Neilson says. To sign up for The Giving Heart newsletter, check them out on Facebook and click “Join the List” on the left side of the page. You’ll receive special notice of all volunteer opportunities with regard to the Thanksgiving Feast. You can also sign up for the newsletter here. In 2009, with a goal of helping even more people, Neilson says The Giving Heart initiated the Secret Senior Valentine Bag project when she realized she had leftover donations from the Thanksgiving Feast. The first year, she worked with the Hanover County Sheriff’s Department, who already had an “adopt a senior” program in place.